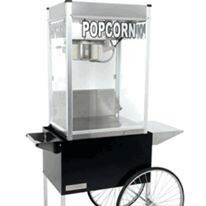 Wow your guests with this great tasting popcorn machine and cart. Perfect to keep your satisfied before a later meal or buffet or to top up at the end of an evening. Comes with retro popcorn bag design and an assistant to serve up that consistently brilliant flavour.